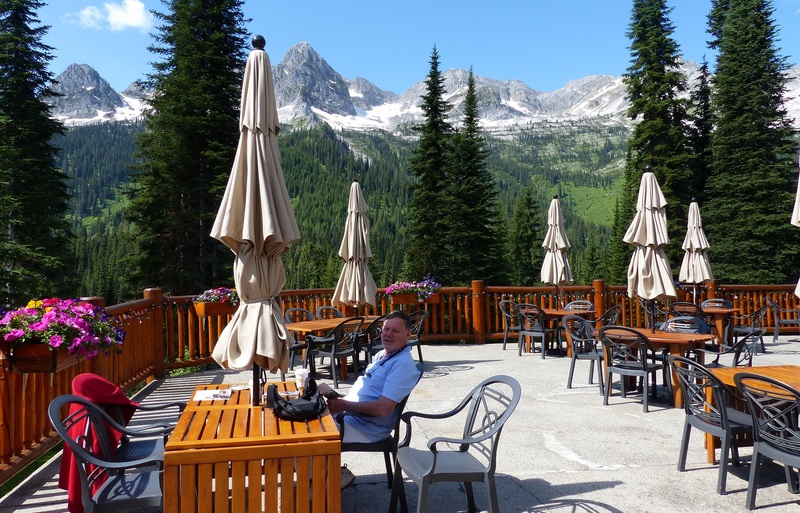 Three Bears Peaks | Frank & Donnis Travel Blog "the more we see the more there is to see"
It is Fathers Day in Canada and USA. Everywhere we went today was Bear and Cougar country…We saw neither. We took a walk in a local park before leaving Fernie. These ducks are so used to seeing people they immediately come to greet you…looking for a free meal. 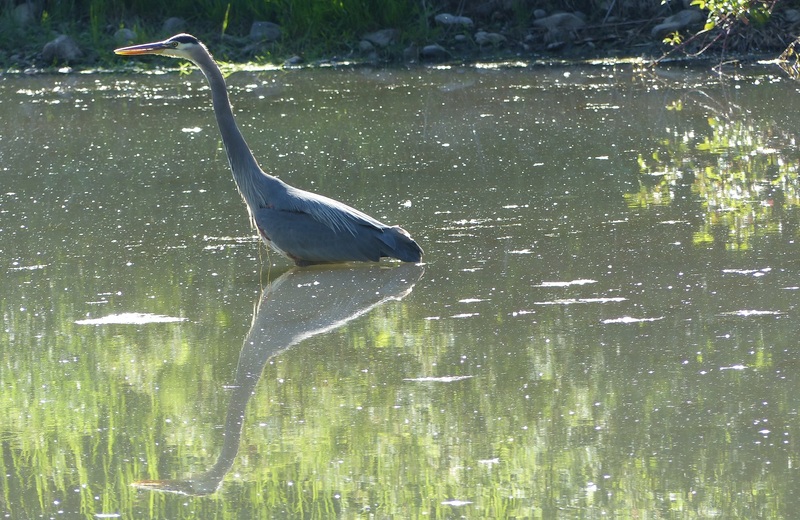 This visitor Blue Heron (much larger than those we are used to seeing in OZ) was sharing the same pond as the ducks. 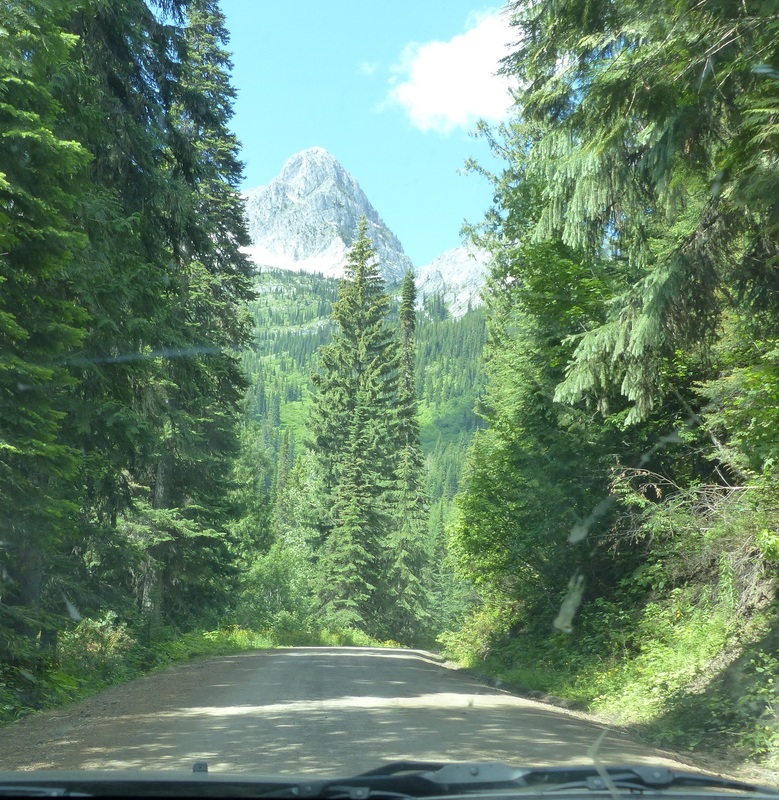 On the outskirts of Fernie we took a turn off the main highway onto a gravel road thinking it was the ski resort. On arrival high up in the hills we found we had arrived at the Island Lake Lodge instead. http://islandlakecatskiing.com/ This resort caters for hikers during summer months and skiers in the winter. 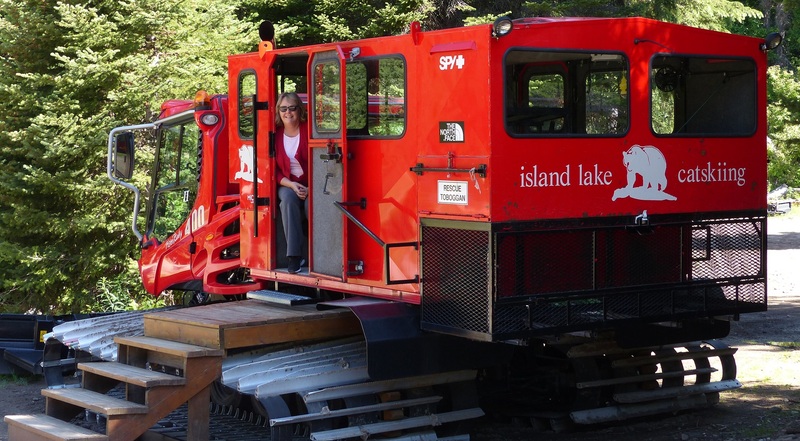 Skiers are taken to remote ski trails via a caterpillar type vehicle and dropped off. vehicles takes skiers to remote locations. http://www.catskiing.ca/what-is-catskiing The sport now rivals Heli Skiing as a way of getting to remote ski locations. 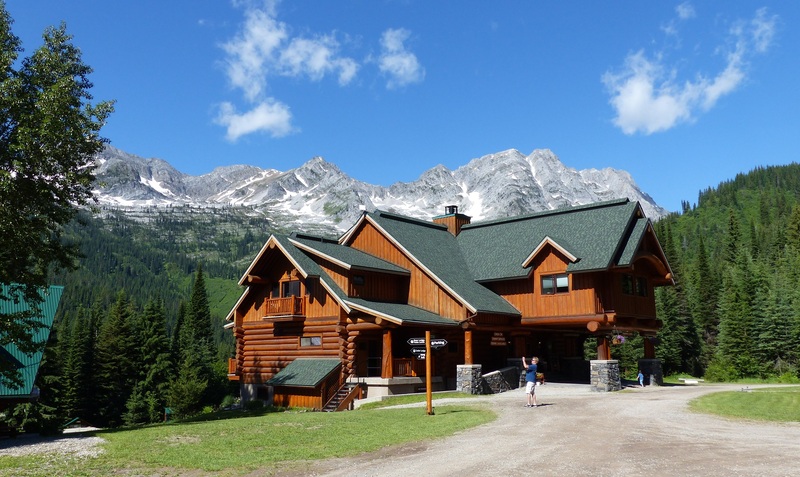 The resort sits in a wonderful location looking up into the mountains especially the three mountains know as the three bears – Daddy Bear, Mumma Bear and Baby Bear. The outdoor dining area was not yet open for lunch but we had our coffee here with a great view of the Three Bears. Mumma Bear is obscured by a folded umbrella. Below the resort is a lake fed by mountain streams in the spring and summer melt. Clearly we were in the wrong place. The reception staff were helpful and even got us a cup of coffee so we could wander around the grounds. The dining room was full with a Fathers Day function so we could not get breakfast despite the smells coming from the kitchen driving us crazy. 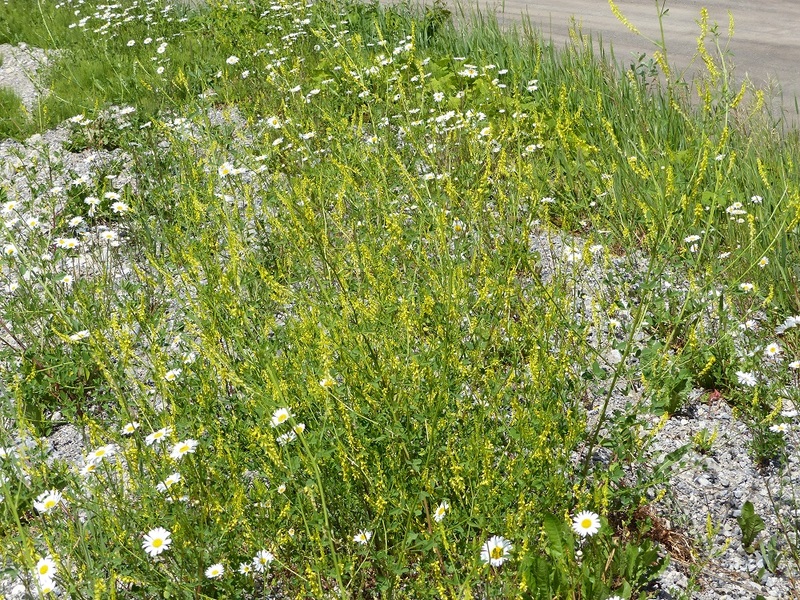 Once back on the highway we found the correct turnoff and reached the ski fields which were basically closed and looked like a ghost town. http://www.skifernie.com/ The chair lift was being tested in readiness for the official opening of summer …next weekend. 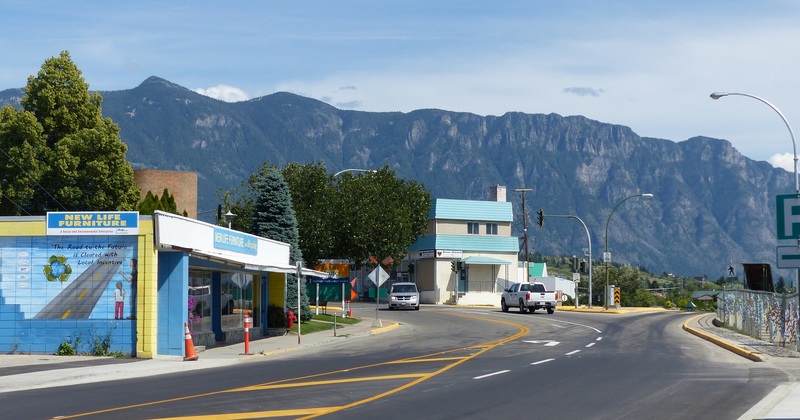 Continuing with the road trip we reached Cranbrook in time for lunch then headed to Creston. We stopped at a delightful RV Resort on the Moyie River in the Kootenay Rockies near the town of Yahk. RV Resort on Moyie River. https://en.wikipedia.org/wiki/Moyie_River We drove through Yahk and after 15 Klms found ourselves at the US Canada Border. Whoops. Did a u turn in the traffic lined up for the crossing and found the turnoff for Creston just outside Yahk. WOT THE! How did we miss it? Now back on Highway 3 we arrived in Creston to stay the night. View from Cresaton main stree. Creston sits in a huge valley which is apparently a great wine grape growing area. There is also a local brewery http://www.columbiabrewery.ca/ and we sampled a glass or two of their Kokanee Glacier Fresh. The other main industry is timber. A quick drive through town showed there was not much else to see apart from a couple of old grain silos, now disused, a relic from the past when grain was grown here. Perhaps it still is. 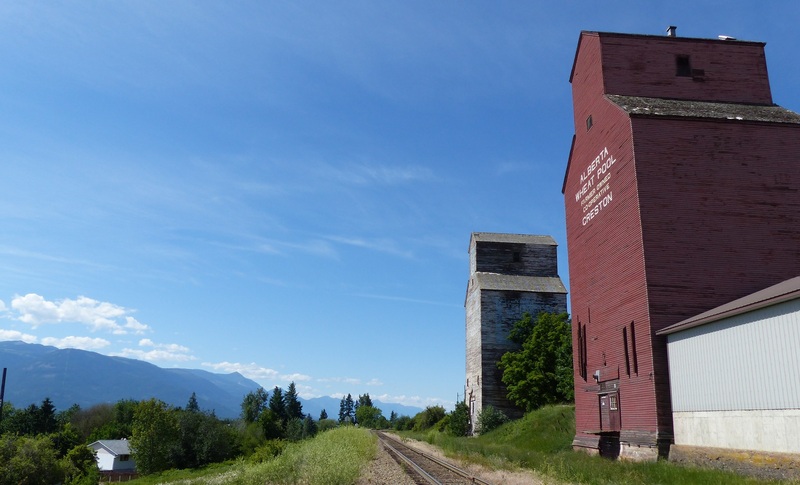 Creston grain elevators. They are disused and look on the verge of self destruction. It being Sunday and Fathers Day much of the sights, including a tour of the brewery were closed. The owner of the motel and chef is a distinguished and multi award winning Thai chef from Vancouver who wanted to escape the rat race. Photos of him in company with film actors are displayed around the dining room walls. Once again the room has no cross ventilation nor a fan or AC. Windows have to be opened wide and we slept with only a sheet but still felt hot. This motel also provides a simple breakfast. We have noticed that |Canadian Hotels and Motels provide for cold winter weather, mostly by a centralised furnace type system along with heavy doonas, quilts and lots of blankets. For summer they do not have cross ventilation or ceiling fans or any fans at all. Only once did we find a room with AC. That was at the Super 8 at Fernie. It seems strange that they all talk of the heat of summer but have no real means of cooling off during the summer.